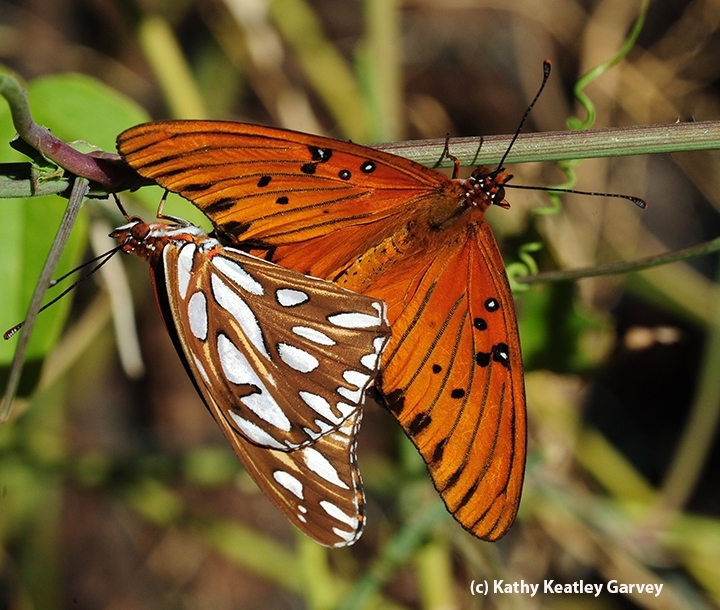 Let's celebrate the Gulf Fritillary (Agraulis vanillae). If you have a passionflower vine (Passiflora) in your yard, you've probably seen these spectacular orangish-reddish butterflies with silver-spangled underwings fluttering around--the males patrolling for females, the mating, the females laying eggs, the caterpillars hatching from the eggs, and the caterpillars munching and crunching until their last instar. Then you'll see them forming chrysalids, and butterflies eclosing. The unseen world of Gulf Frits. The miraculous unseen world of Gulf Frits. Because it is. That came to mind the other day when two passersby saw a dozen or so Gulf Frits heading into our yard. "Look at all the butterflies!" one exclaimed. "I wonder what's attracting them." "I don't know," the other said. "They must have a butterfly bush, maybe?" "Oh, that's probably it. A butterfly bush." Well, what's attracting them is the Passiflora, the host plant of the Gulf Frits. It's a congregation without a church. It's a gathering without a sermon. It's Nature at its finest. 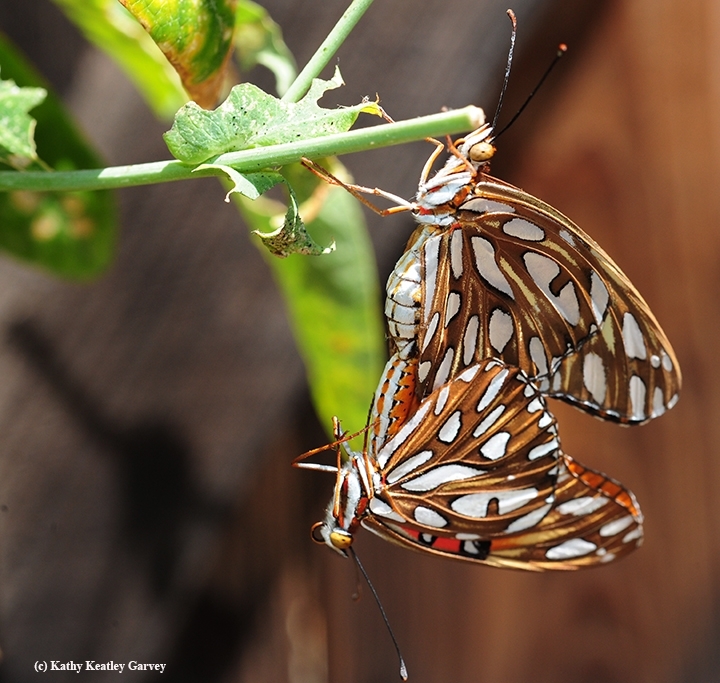 The Gulf Frits, aka "passion butterflies," lay their eggs only on the passionflower vine--mostly on the tendrils or leaves. 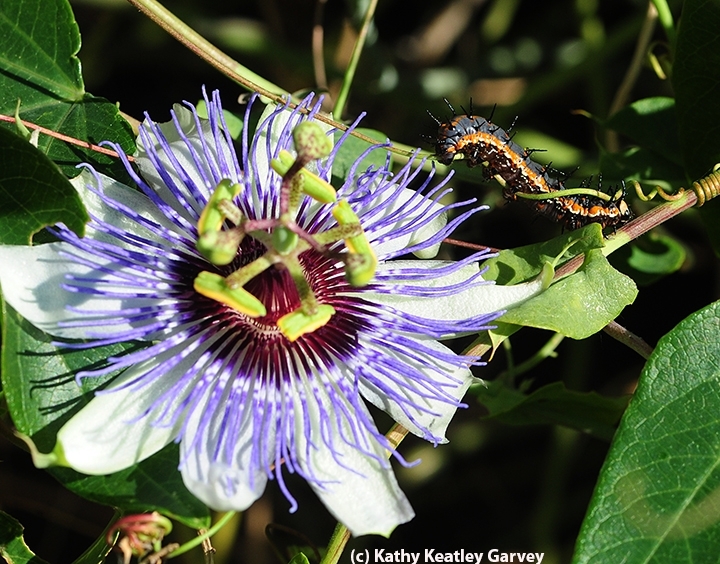 The caterpillars will eat only Passiflora. The adults? They'll nectar on such plants as the butterfly bush, Mexican sunflower and lantana but will stay close to the Passiflora for mating and egg-laying. 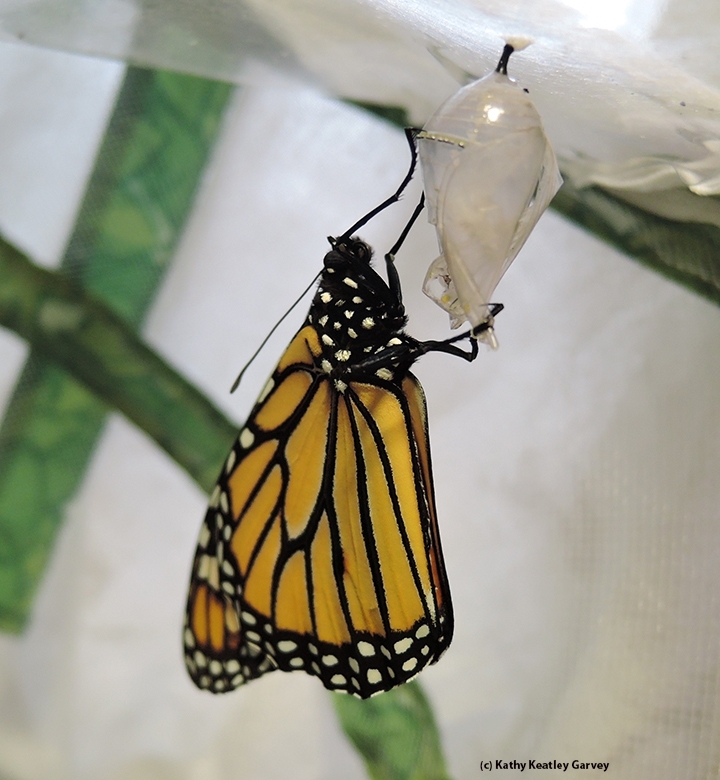 If you're lucky, you'll see the entire life cycle--from egg to caterpillar to chrysalis to adult. If you're really lucky, you'll see the tiny yellow eggs, which are about the size of the period at the end of this sentence. The yellow eggs turn from orange to rust, the color of the caterpillar inside. Today I explored the unseen and intricate world of Gulf Frits in our Vacaville (Solano County) backyard, managing to capture a few images. Then the unexpected happened. For the first time in the five years we've been rearing Gulf Frits, one landed on me! Apparently mistaking me for a plant, she touched down on my green t-shirt (which probably carried the scent of the passionflower vine). She was all set to lay an egg until....two males approached. Startled and a bit rattled--hey, I'm laying an egg here, leave me alone!--off she flew. This time she vanished inside the depths of the passionflower vine. With any luck, she'll do just fine in this congregation without a church, in this gathering without a sermon. She'll provide another generation that resembles the striking colors of those stained glass windows in a religious sanctuary. 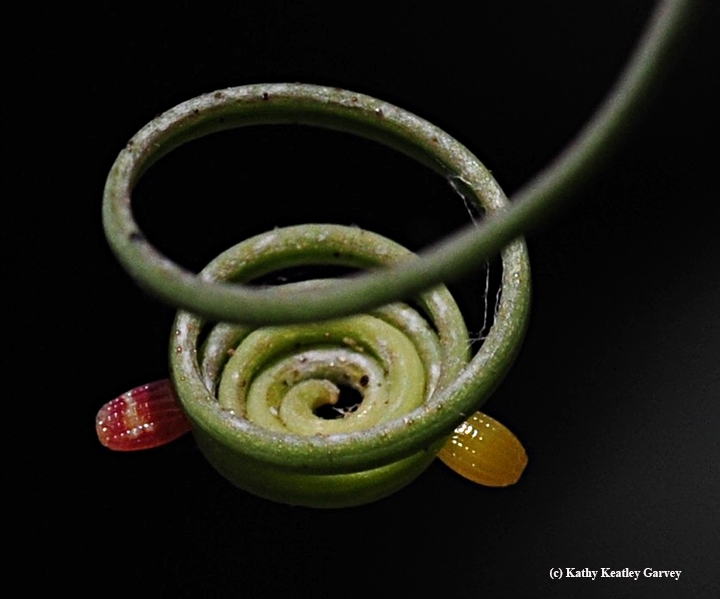 If you look closely, you'll not only see the cycle of life in your garden, but art as the center of life. Take the Gulf Fritillaries. They're a stunning orangish-reddish butterfly (Agraulis vanillae) with silver-spangled underwings. It's a delight seeing them laying eggs on their host plant, Passiflora (passionflower vine), watching an egg develop into caterpillar, a caterpillar form a chrysalis, and an adult eclosing. 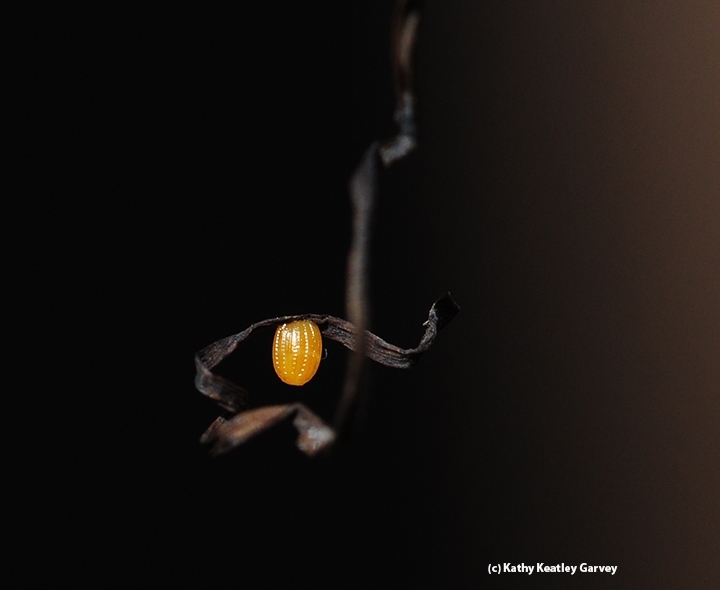 An empty chrysalis or pupal case hanging like a broken chandelier. Butterfly expert Art Shapiro, distinguished professor of evolution and ecology at the University of California, Davis, says this is a good year for Guld Frits. 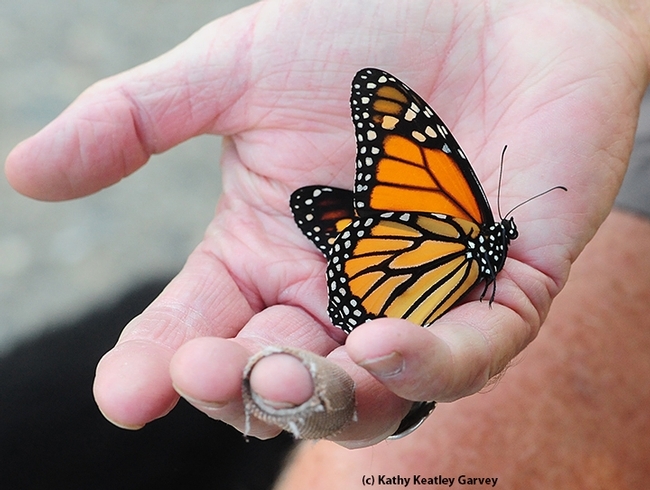 He has studied the butterflies of central California for more than four decades. Check out his research website, Art's Butterfly World. Thank goodness for Gulf Frits! 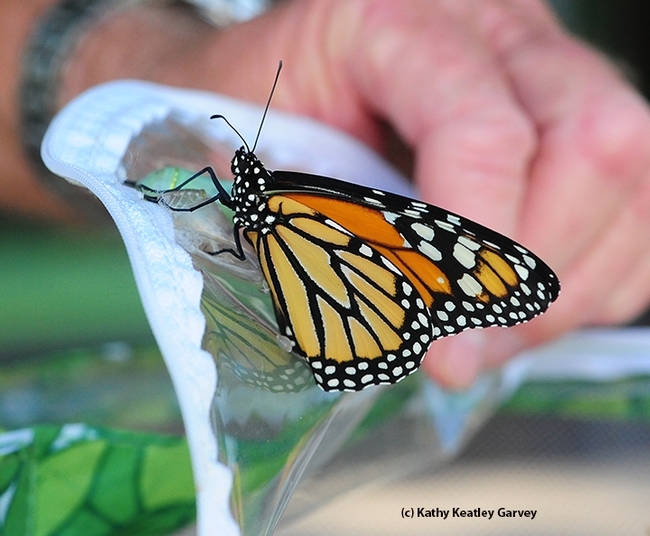 Oh, the joys of rearing monarch butterflies. Not for commercial purposes. For conservation purposes. 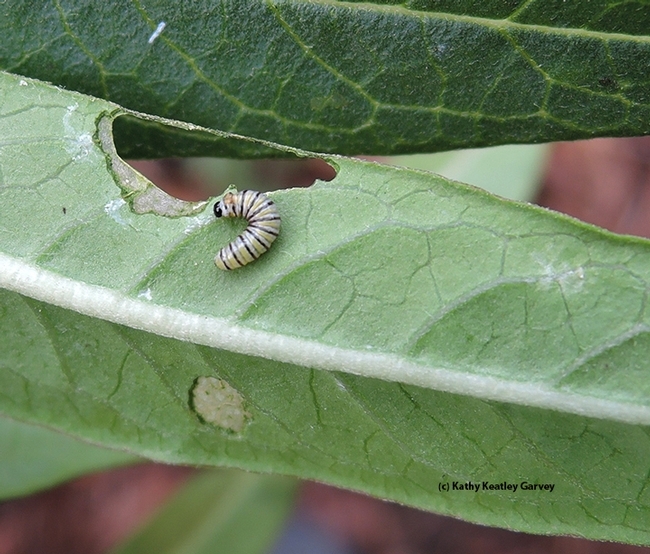 For a couple of months now, we've been watching the monarch caterpillars slowly disappearing from our milkweed plants. We'd see fifth instar 'cats one day, and the next day, they'd be gone. Then we'd see the Western scrub jays flying through the yard and landing near the plants. Culprits! Okay, we thought, we'll get some bird netting to circle the milkweeds. The net kept the birds out but not the 'cats. They crawled out of the bird netting right into the beaks of the birds. Okay, we thought, how about some tulle or wedding veil-type fabric or those zippered hampers to pop over the plants? Those worked better. Not as many escapees. But what really worked was bringing the caterpillars into the house and placing them into the butterfly habitat containers (from the Bohart Museum of Entomology, University of California, Davis). Daily we'd feed the 'cats bouquets of fresh milkweed tucked into a narrow-throated, flat/wide-bottomed bottle. I think that in its other life, it was a tequila bottle. It went from borrowed tequila bottle to butterfly bottle. The first one to eclose was a male. The second one, a female. Releasing them was pure joy. Then today, two more eclosures. First, a male. Then a female. As soon as their wings dried, we released them. The male fluttered rather clumsily (okay, it was his first flight). The female preferred to soak up some sunshine as she clung tightly to a butterfly bush. If we hadn't brought the caterpillars into the house, would they have reached the adult stage? Probably not. Scientists say that only 10 percent make it from egg to adult in the wild. 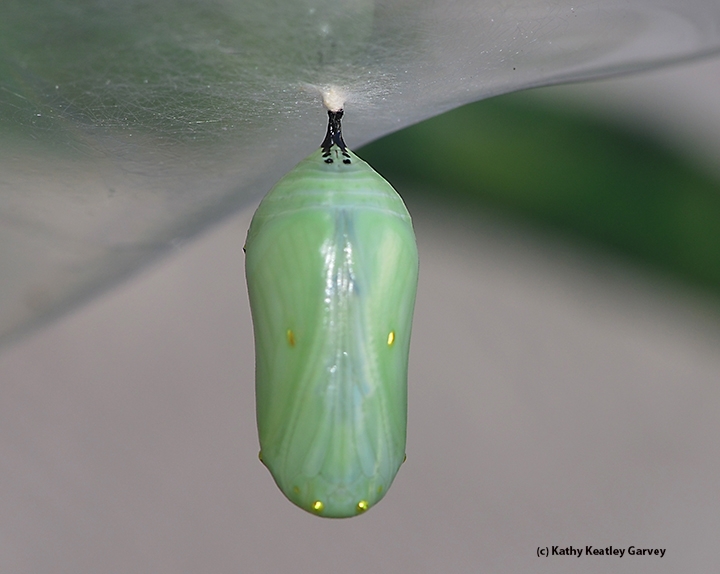 Watching the transformation from egg, to caterpillar, to a gold-studded jade-green jewel (chrysalis) to an adult is just plain exhilaration and jubilation. Such bliss. No wonder monarch conservations are addicted. It's like watching the miracle of life unfold. Hollywood actors and actresses who deliver their acceptance speeches at the Academy Award ceremonies have nothing on us. "First we'd like to thank the nursery for providing these narrow-leafed milkweeds. Then we'd like to thank the Good Earth for providing such a healthy environment to allow the growth of these plants. Then we'd like to thank Mr. and Mrs. Monarch for..um...getting together, and Mrs. Monarch for kindly laying her eggs on these plants. Mrs. Monarch, that was really very nice of you! Thank you so much!" "And finally, we are here to tell you that change is good. It can transform you. 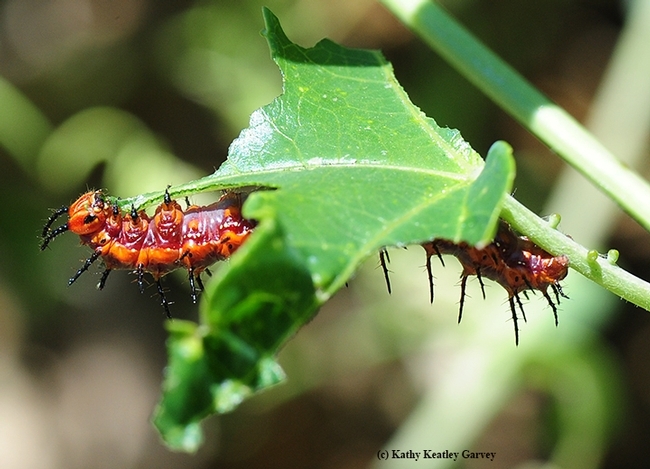 You say you don't believe that a leaf-munching caterpillar can become a glorious butterfly? Let us tell you what the word, metamorphosis, means to us. Met-a-more-for-us. More for us. More for the world. (Applause, standing ovation) Thank you, thank you! Monarchs rule!" Have you ever seen a monarch butterfly (Danaus plexippus) lay an egg on her host plant, the milkweed? Have you ever seen a close-up of the egg? The larva or caterpillar? The chrysalis? 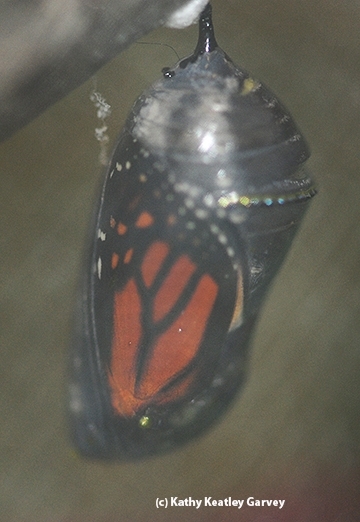 The eclosure (when the adult emerges from the chrysalis)? Not all eggs will make it. 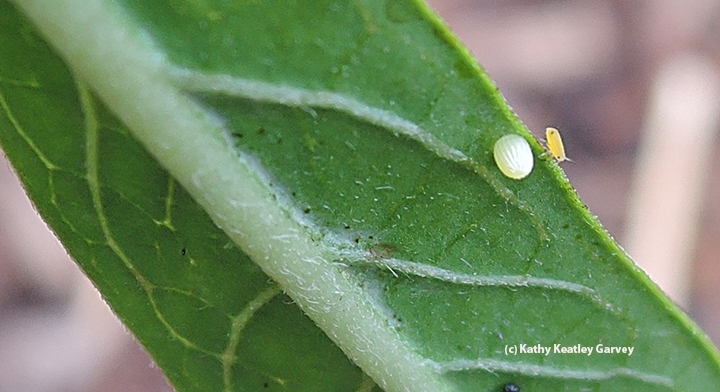 Predators, such as lady beetles and their larvae, gobble up monarch eggs along with those tasty aphids. Birds, such as scrub jays, swoop down and make off with an occasional caterpillar. Then when the fifth instar finally starts to form a chrysalis, there's always the question of whether it will do so. Some are deformed and turn out to be half chrysalis and half caterpillar. 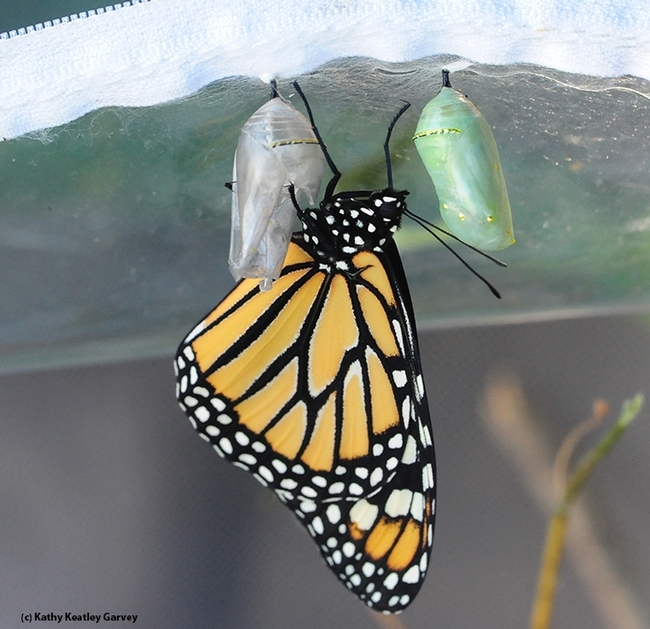 But once you've watched a complete metamorphosis, you'll never underappreciate monarchs again. In fact, you'll probably start rearing them every year. We just reared our first two this month. It's easy to see why teachers and their students get so excited. We remember writing about Sal (Sally) Levinson's newly published book, Butterfly Papercrafts, which contains 21 indoor projects for outdoor learning. Levinson, who studied entomology at the graduate level at UC Riverside and UC Berkeley, wants to inspire youngsters to learn about our amazing world of butterflies through art and a little science. It's intended for youngsters ages 5-12, but really, it's also a beginner's book for all ages and a teacher's treasure. And it's priced right--under $10 ($9.99). 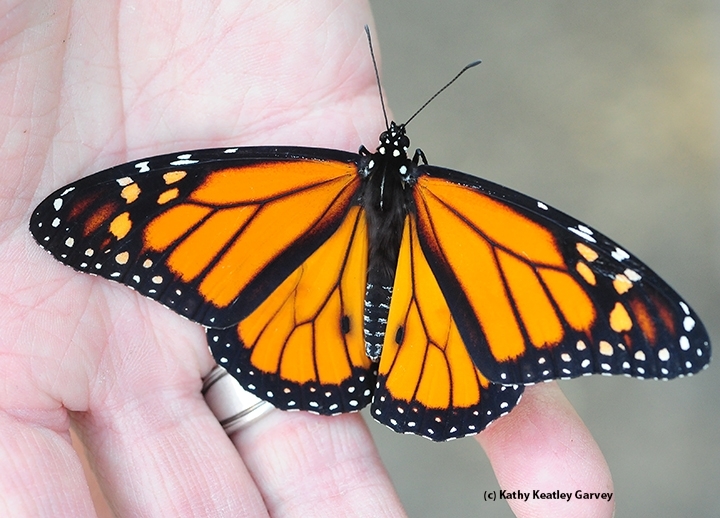 Readers can learn about the life cycle, from egg to caterpillar to chrysalis to adult; and craft a butterfly paper airplane, a caterpillar flip book, and a monarch finger puppet. Meanwhile, North America's monarchs are heading for their overwintering sites in two main areas: the mountains of central Mexico, and choice spots along the California coast, including Pacific Grove and Santa Cruz. 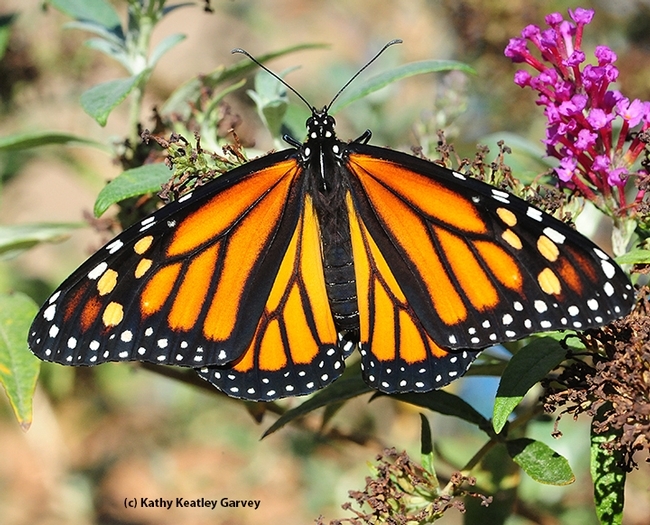 "The annual migration of North America's monarch butterfly is a unique and amazing phenomenon," according to the U.S. Department of Agriculture's Forest Service website. 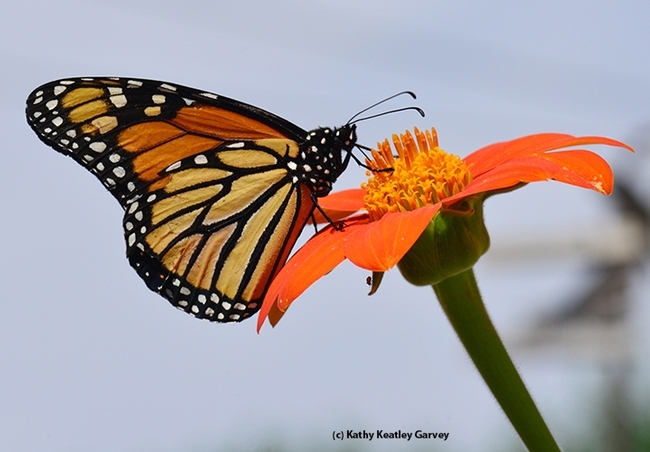 "The monarch is the only butterfly known to make a two-way migration as birds do. Unlike other butterflies that can overwinter as larvae, pupae, or even as adults in some species, monarchs cannot survive the cold winters of northern climates. Using environmental cues, the monarchs know when it is time to travel south for the winter. Monarchs use a combination of air currents and thermals to travel long distances. Some fly as far as 3,000 miles to reach their winter home." You'll see a migration map on the Forest Service website. 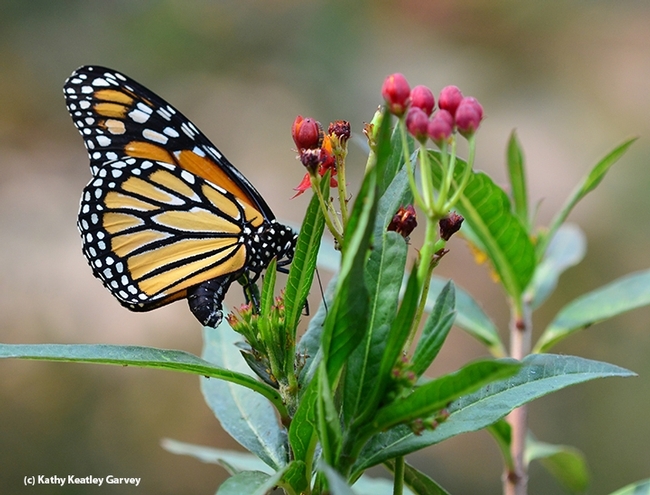 You can check out the monarch sightings on this map and report the ones you see. It's something you don't see every day. I'm used to seeing Gulf Fritillary chrysalids hanging from our passionflower vine (Passiflora) but this thing hanging from our African blue basil was not a chrysalid. 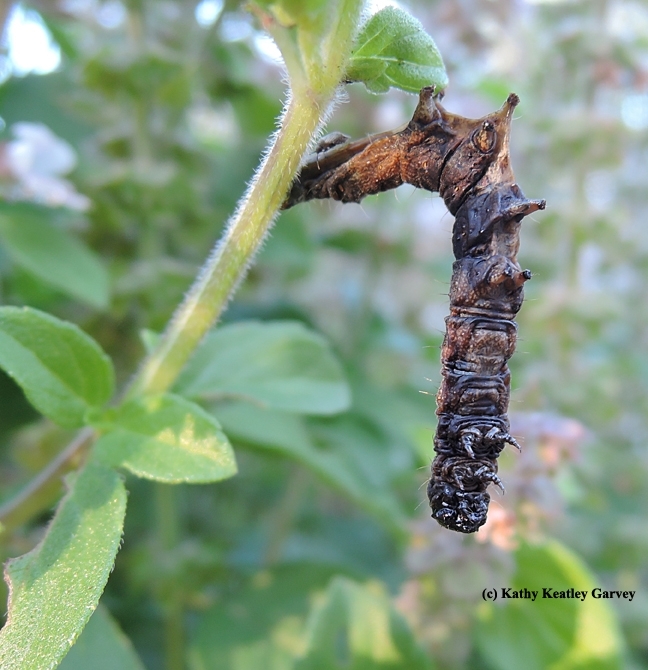 "It's a dead caterpillar killed by an infectious virus disease (polyhedrosis)," said butterfly expert Art Shapiro, distinguished professor of evolution and ecology at the University of California, Davis. Naturalist Greg Kareofelas, an associate at the Bohart Museum of Entomology, figured it could be the remains of a noctuid (moth). "It kind of looks like it," he said. "It is definitely dead." Those who rear butterflies see polyhedrosis quite often, I'm told. All I've reared are a few Gulf Frits. Scientific name, Agraulis vanillae. 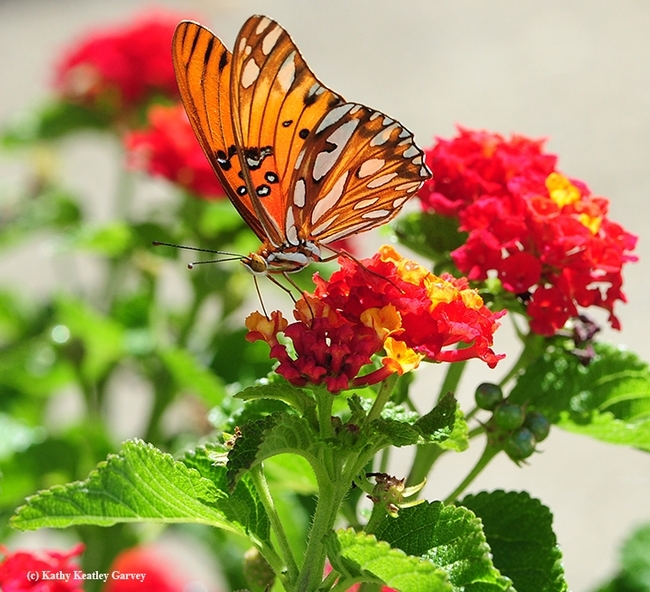 They're beautiful reddish-orange butterflies with iridescent silver or "spangled" undersides. 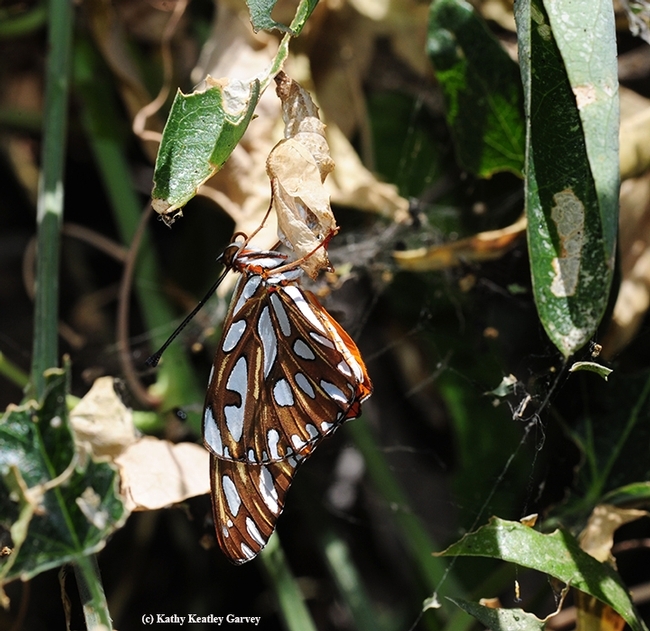 "A dead insect like this, hanging from the upper foliage, is very classical of a NPV-infected caterpillar," said researcher Shizuo "George" Kamita of the Bruce Hammock lab, UC Davis Department of Entomology and Nematology. "Nucleopolyhedrovirus (previously called nuclear polyhedrons virus) is a type of baculovirus that is commonly found in the environment. Baculoviruses are used as a biological insecticide against caterpillars. Twenty years ago Bruce's lab was involved in genetically modifying the wild type baculovirus to improve its ability to reduce feeding damage." Professor Shapiro pointed out that "Polyhedroses are extremely infectious. Dispose of the cadaver and wash off the areas vertically below it with a forceful spray, if you don't mind wasting the water. 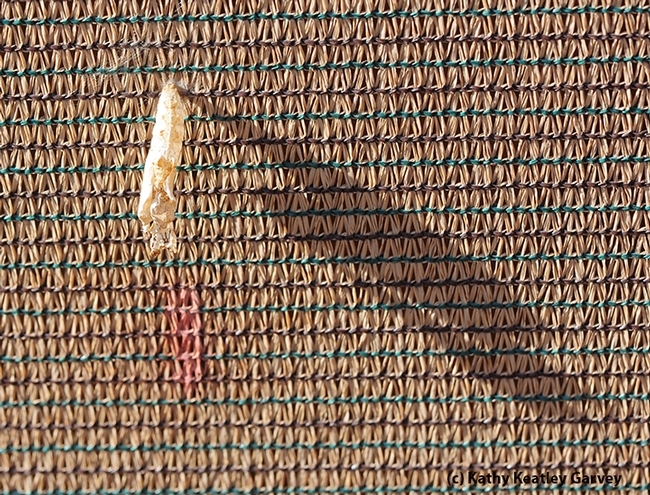 The dying larva drips infectious liquid. Kind of like Ebola!" So we bagged the dead caterpillar and turned the hose on the leaves. As we did, we noticed life as usual: honey bees nectaring the African blue basil blossoms, and a tiny white crab spider lurking.